Mmmm, roasted garlic. It’s divine spread on toasted slices of baguette, or in a pasta tossed with a bunch of fresh veggies, in sandwiches, or on top of pizzas. Roasting garlic also mellows the flavour a bit, so you can pop it into recipes where you want to even out the sharpness of raw garlic — like in salads. You can also use it in soups — roasted garlic and root veggies is a lovely combo. I tend to pop a bulb of garlic in the oven whenever I’m roasting other veggies — if I’ve got the oven on, I might as well roast some garlic. Then I keep it in an airtight container in the fridge and use it in everything for the rest of the week. Unless it all goes onto toasted baguette. Slice off the top bit (about 1 cm or 1/2″) of the bulb of garlic, slicing right across the top. Spoon 2 tsp. 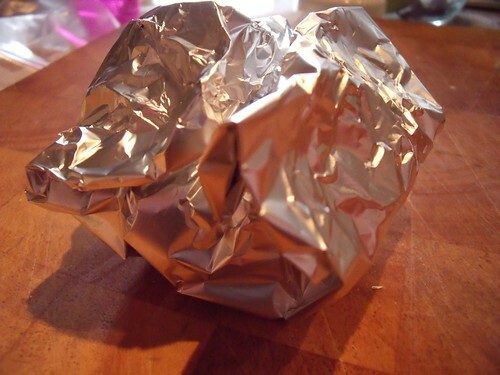 of olive oil over each bulb of garlic, and wrap up in a little foil package. 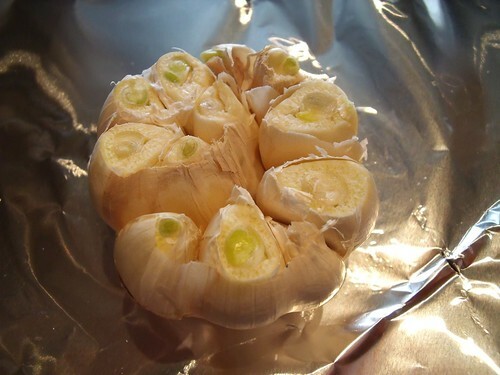 You can include one or two bulbs of garlic in each package. Bake each package at 350F for 30 min, until the cloves are soft and mouth-meltingly delicious. 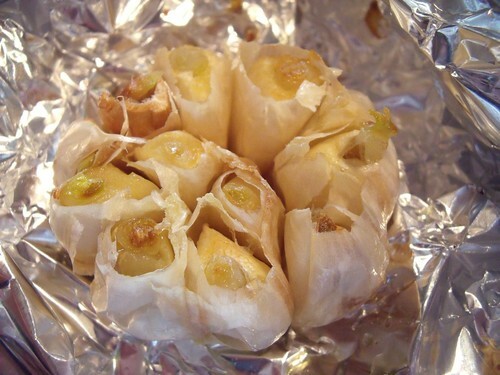 Squeeze each clove out of its garlic-paper wrapping, and eat with delight. And a toothbrush. Mmmm…I love roasted garlic. We have a terra cotta garlic roaster that works GREAT!! I just soak it in water for a while, then put the garlic right into it with a little EVOO drizzled on it…sooooo good. I love it too, and could put it on EVERYTHING! Oooo, thanks for this! I always manage to stuff up roasting my garlic!